"Redeemed by reason of the merits of her Son and united to Him by a close and indissoluble tie, she is endowed with the high office and dignity of being the Mother of the Son of God, by which account she is also the beloved daughter of the Father and the temple of the Holy Spirit. Because of this gift of sublime grace she far surpasses all creatures, both in heaven and on earth. At the same time, however, because she belongs to the offspring of Adam she is one with all those who are to be saved." Mary embraces God's will and freely chooses to cooperate with God's grace, thereby fulfilling a crucial role in God's plan of salvation. Throughout the centuries, the Church has turned to the Blessed Virgin in order to come closer to Christ. Many forms of piety toward the Mother of God developed that help bring us closer to her Son. In these devotions to Mary, "while the Mother is honored, the Son, through whom all things have their being and in whom it has pleased the Father that all fullness should dwell, is rightly known, loved and glorified and . . . all His commands are observed." The Church honors her as the Mother of God, looks to her as a model of perfect discipleship, and asks for her prayers to God on our behalf. Mary Month – Why May? There was an ancient tradition of connecting May with new life and fecundity, led to a realization that May is very much the month of motherhood – this may be the reason why Mother’s Day is celebrated during May . Though English words like 'worship' and 'adoration' are occasionally used to signify only veneration, honor or affection, they are generally understood to refer to that highest type of worship reserved for God alone. In this sense, Catholics do NOT adore or worship Mary, or any other created person or thing. The Ecumenical Council held at Nicaea in 787 considered the issue of veneration which is not directed to the Divine persons in relation to sacred images. At this Council, the Church taught that the special type of worship called adoration may only be offered to God: Latria from the Greek term for enslavement. However, the Church also acknowledged that certain persons, though only creatures of God, are entitled to honor or veneration of a qualitatively lesser degree than the absolute allegiance owed to God. The Conciliar Fathers termed this lesser devotion:Dulia. Such veneration was proper for Mary and the Saints. In view of Mary's important role in salvation history as Mother of Jesus, the Church recognized that Mary warranted a special degree of honor among the Saints. For this class of devotion, St. Thomas Aquinas (d. 1274) suggested the term hyperdulia. No, Catholics do not worship Mary, if by worshiping is meant adoring. She is not God for us, has never been and will never be. Addressing prayer to Mary is like asking a dear and close friend for help. Do we make a God of our friend when asking him to keep us in his prayers? Do we divinize him/her when asking for his prayerful support in sickness and the trials of life? Believers on earth and in heaven constitute a living community which the major Christian denominations recognize as the communion of saints. The saints in heaven are not dead. Their Christian example of virtuous living and their closeness to God make of them powerful allies for us struggling mortals. They do not take God's place; they are an expression of his grace. Q. Why do Catholics pray to Mary? A. 1. A saying that is well known among Catholics is, "To Jesus, through Mary." This does not mean, "To Mary, through Jesus." Nor does it mean, "To Jesus and to Mary." This saying affirms that Catholics do not pray "to" Mary as an equal to God. They pray "through" Mary as an intercessor who prays to God on behalf of mankind. If Catholics were to pray to Mary, this would imply that they are worshipping her as a god. But Catholics do not perceive Mary as a god. (i) They honour the Blessed Virgin Mary. (ii) The view Mary as the holiest of all the Saints. (iii) The accept the fact that Mary is the most successful Saint at obtaining Divine favours through her intercession. Q. Is there any Biblical support for the belief of Catholics to call upon Mary to intercede to God on their behalf? A. First of all, because Mary was the birth mother of the humanity of Jesus in who "the fullness of the deity (God) was pleased to dwell bodily," [Col. 1:19, 2:9] Catholics recognize the Virgin Mary as the Mother of God. Secondly, because Mary was "favoured by God" [Lk. 1:30] when she was personally chosen by the Lord to become the mother of Jesus, God incarnated, Catholics believe that they have a greater chance of obtaining God's grace for their daily physical and spiritual needs by asking Mary to intercede on their behalf. Thirdly, the above mentioned belief is partially based on the fact that Jesus is the King of kings and Mary, as the mother of the King, is the "queen mother." Then, when studying Jewish history, it is discovered that the institution of the "queen mother" was established during the reign of King Solomon. Similar to the intercession of the Queen Mother, when a child desires a favour and cannot obtain it from his/her parents, frequently the child will make the request to the grandparent to intercede on his/her behalf, therefore obtaining the favour that was being sought. This does not mean that the child is seeking the parental favour from the grandparent. Rather, the child is seeking the intercession of the grandparents before the parents. Furthermore, Catholics do not differentiate between the living (in this world) and the dead (those who departed) members of the Body of Christ (the fullness of the Church.) The fullness of the mystical Body of Christ is found in the union of all the saints, past and present, here below and those above in Heaven. In view of the aforementioned, it cannot be denied that those who were called to Heaven, including Mary, are still alive in spirit in the Kingdom of God that coexists with our world. As some non-Catholics pray through their deceased parents, grandparents or other biological relatives, asking these beloved departed persons to intercede before God on their behalf, Catholics pray through Mary to Jesus, taking advantage of her blessed position as the Mother of God. This Catholic action affirms the prophetic and Divinely inspired passage that is found in the Holy Bible where it states, "Surely, from now on all generations will call me blessed." [Lk. 1:47] All generations could not call Mary blessed if she was not actively involved in the progressive Divine Plan that continues to develop before our eyes. 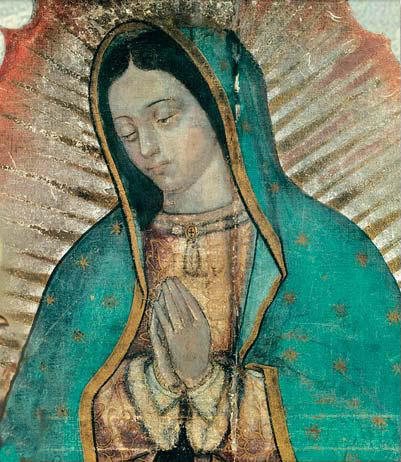 Indeed, all generations have called the Blessed Virgin Mary blessed, including this one, because she has never stopped interceding on behalf of the world, her intercession obtaining endless miraculous cures and other favours. The role of Mary in the area of obtaining physical miraculous cures is well known and documented in Lourdes, France, this being only one of the many holy places where the grace of God has been manifested through the Virgin Mary at apparition sites. A canonization today is the Church's official declaration, through the decision of the pope, that a person is a saint, truly in heaven and worthy of public veneration and imitation. The process begins by naming the person "Venerable," a "Servant of God" who has demonstrated a life of heroic virtue. The next stage is beatification, by which a person is named "Blessed." This step requires one miracle attributed to the intercession of the Servant of God. For canonization, a second miracle is needed, attributed to the intercession of the Blessed and having occurred after the individual's beatification. Miracles are not required for martyrs. The pope may dispense with some of the formalities or steps in the process. 108. Why did Jesus manifest the Kingdom by means of signs and miracles? Jesus accompanied his words with signs and miracles to bear witness to the fact that the Kingdom is present in him, the Messiah. Although he healed some people, he did not come to abolish all evils here below but rather to free us especially from the slavery of sin. The driving out of demons proclaimed that his cross would be victorious over "the ruler of this world" (John 12:31).